The Ravenna interface card allows to connect the DMI 8 to Ravenna/AES67 networks and allows in AES 67 mode even streaming to DANTE devices in AES 67 mode. According to AES67/Ravenna PTP is used to synchronize the DMI to the network. Via an internal webinterface the user can control microphone and DMI parameters. The DMI-8, an eight-channel version of the digital microphone interface is considerably simplifying the setup for multichannel applications. 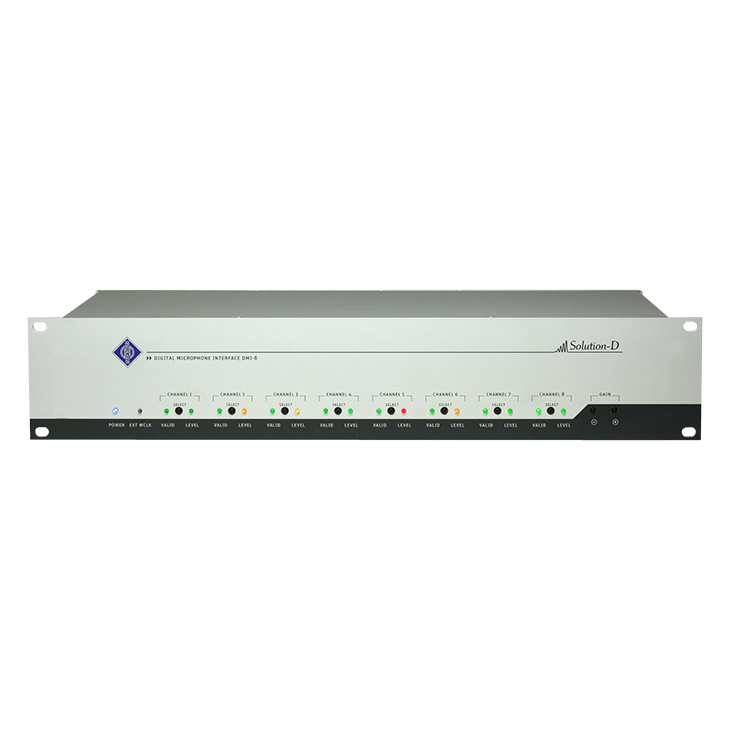 The DMI-8 offers several possibilities for easy integration into audio networks. The ES100 (DMI-8) module permits integration into EtherSound networks. Connection Set for the connection between the DMI-8 and the USB port of the computer. DMI-8 Synchronization: automatically to an external word clock or AES11 signal, if present, otherwise the internal word clock generator is activated.